Speaking of Cronuts … have you had one? This was my first! A Cronut is described as a croissant-doughnut hybrid … my version is a hybrid of that hybrid … crescent rolls baked in a donut pan! These Rainbow Cronuts came about after a coffee meeting with some girlfriends … I was sharing my ideas about making a pot of gold (will be posted shortly) for St. Patrick’s Day. 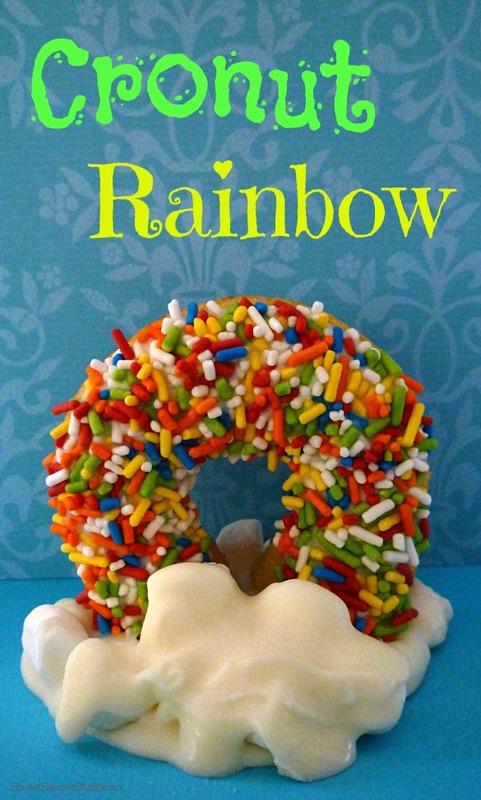 The thought of a donut rainbow came up … took that idea and ran with it! 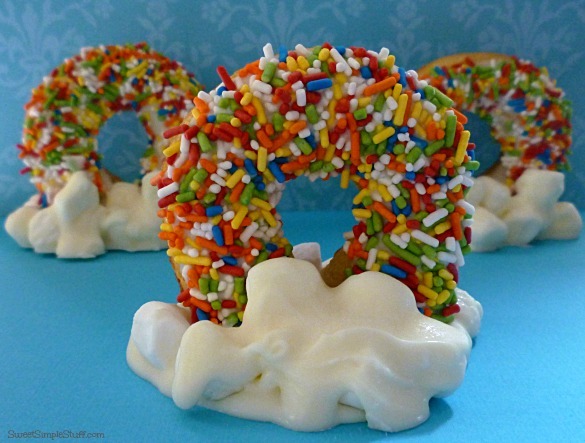 No donut would be complete with rainbow sprinkles and no rainbow would be complete without puffy white chocolate marshmallow clouds! Preheat oven to 350°F. 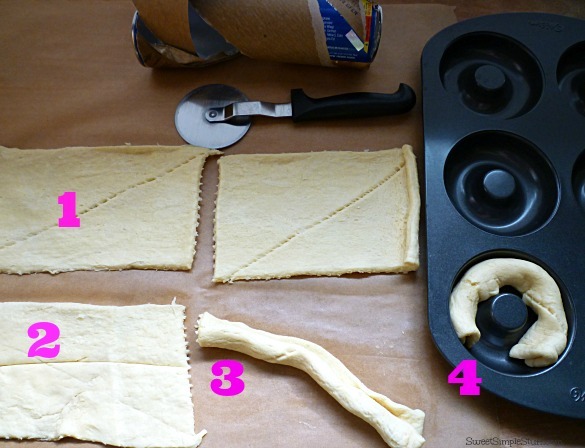 Open crescent rolls and separate into 4 rectangles (I worked on parchment paper). Use your fingers to press the diagonal seams together. Cut each rectangle into 2 long rectangles. Roll each rectangle into a long tubular shape. Place into donut pan that has been sprayed with non-stick cooking spray. Bake 10-13 minutes or until golden brown. 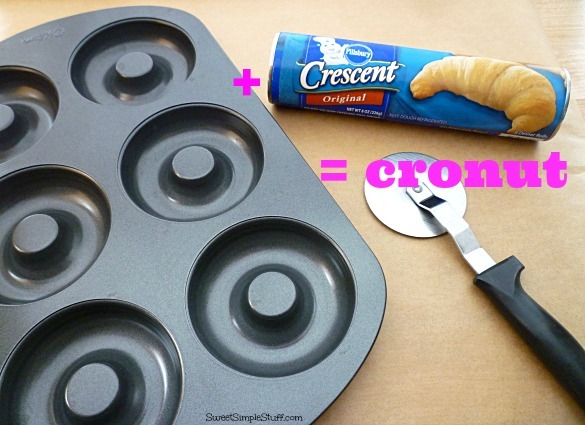 Remove rolls from pan and cool completely on wire rack. Melt candy coating according to directions on package. Dip one side of cronut into candy and tap off excess candy. Place back on wire rack. Let sit at room temperature until candy hardens up. Before mixing marshmallows into melted candy, I recommend to … 1) keep melted candy on a warm surface (such as an electric skillet/griddle) or 2) divide chocolate into two portions, mix and use one portion at a time. I say this because my candy/marshmallow mixture was cooling off … I microwaved it and the marshmallows started to melt a little, creating a sticky mess … learn from my mistakes 😉 Mix about 2 cups marshmallows into candy, add more if desired. Spoon some marshmallow mixture on parchment. 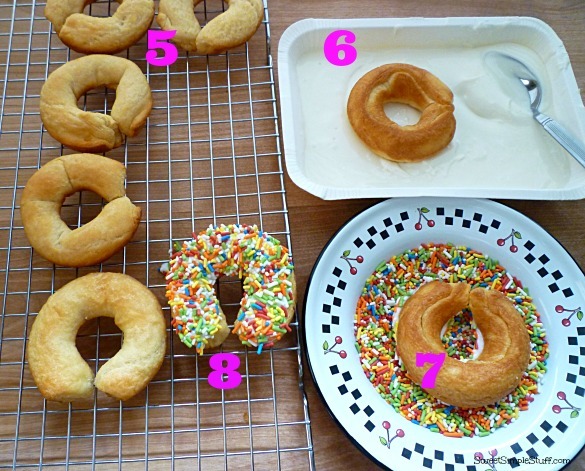 Use the spoon to create a “well” in the center for the cronut. 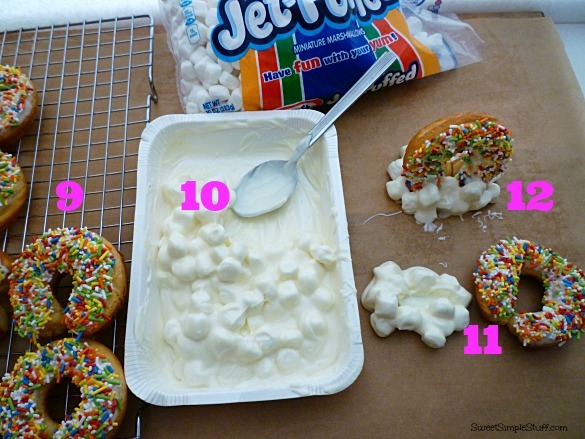 Immediately place a rainbow cronut (gap side down) into the marshmallow cloud. You may need to hold it for a moment. Add a few more marshmallows if desired. If you have leftover marshmallow/candy mixture … drop spoonfuls on parchment and add sprinkles … let harden up … you will have marshmallows clusters as an added treat! These colorful cronuts were a big hit with my family and the neighbors. I hope you make some and enjoy them as much as we did! 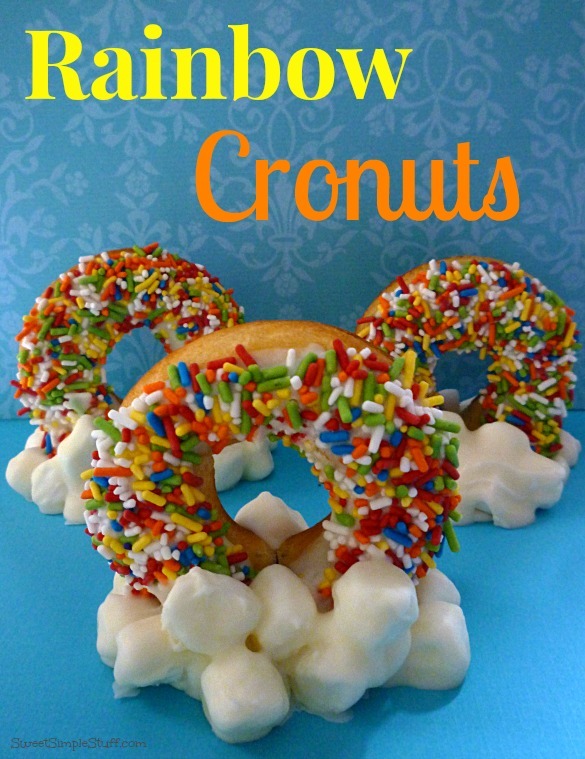 My next post will feature the pot of gold that can be found at the end of every cronut rainbow … be sure to check back! These look Fantastic and I even have that pan but seldom use it. Me thinks I will be using my pan more often from now on. Thank you Colleen 🙂 I too have to remember to pull out the pan and use it! genius!!! 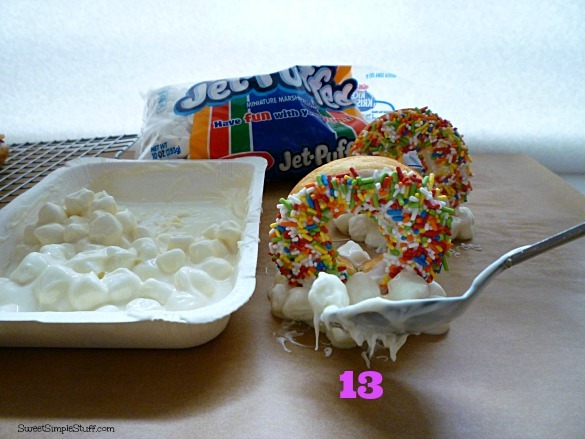 i made rainbows in a donut pan before but your addition of the marshmallows make it so fun fun fun! 🙂 love these Brenda and i will have to make the cronuts too! Thank you Lisa! I probably should have called them cheater cronuts! Adorable idea for a St. Patty’s Day treat, Brenda. Thank you Karene 🙂 If you need to buy one … try Michael’s, JoAnn’s, Hobby Lobby, Amazon or anywhere that sells Wilton. If you need to find it in your cupboard … sometimes I have the same problem!